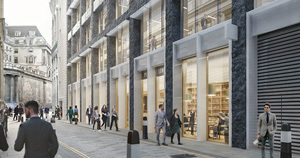 Mitsui Fudosan UK and Stanhope are set to sign Neil Rankin, the chef credited with spearheading London’s barbecue restaurant scene with the launch of the original Pitt Cue Co restaurant in 2012, at their Angel Court scheme in the City. The move will see Rankin open a second version of his Soho-based Temper restaurant, this time in the City, CoStar News can reveal. Rankin until recently ran the kitchens at the Smokehouse pubs in Islington and Chiswick before opening barbecue restaurant Temper on Broadwick Street in Soho last year. Rankin is understood to be taking a 4,800 sq ft unit at Angel Court, which topped out in April of last year and became available in October. It is the last restaurant unit available at the 300,000 sq ft development joining Peruvian restaurant Coya, Natural Kitchen and coffee and wine bar Notes. Angel Court was designed by Fletcher Priest Architects which sought to create a sustainable, urban workplace in the form of a light, bright, glass tower. Neil Rankin was advised by Bruce Gillingham Pollard. Nash Bond advises Mitsui and Stanhope.